If you like off-road driving you can reach the area of Jibal Ghuzayma from the Hisa Phosphate Mines, after exiting the heaps of phosphate you should be guided by Taweel Shihaq- the solitary mountain that should be visible some 15 km to your right as you are driving southeast. Jibal Ghuzayma area starts at the first sharp escarpment about 30 km to the southeast of the last phosphate mine. You can also reach the area through the Azraq road from the north, or through the Jafr road from the south. This destination needs a reliable 4x4, and make sure you bring enough water. You can also try to find other sites on the way, or in the surrounding, such as Qasr al Mushaish, Bayer, al Raha and Taweel Shihaq. The exact location where the dinosaur fragments were found will be kept confidential, in order to protect the context. There has been, for the last two years, a group of people combing the country for fossils. Part of this group, Dr Hakam Mustafa from Yarmouk University and Iyad Zalmout, a PhD student at Michigan University, were working much earlier, on specific locations that yielded important scientific material. As the excitement became more coordinated, creating a competitive mood that fueled a restless wave of field-trips, this informal team picked up a shared vision of where to search, what to look for, and what geological layers to follow. With us, Dr Ahmad Smadi, from the Natural Resources Authority, along others from the NRA, picked up the fossil hunting fever. Many field trips were made, often to the most God-forsaken areas, scanning the escarpment overlooking Wadi Rum from the north, and, later on, looking in the areas to the northeast of Jafr. In geology, every bit of information ads up to the enrichment off the bigger picture; a layered picture where hundreds of millions of years are compressed as a record of rock. Looking for dinosaurs requires understanding the geological formations so well that one starts reconstructing a mental image of the landscape and the habitat where dinosaurs would have lived. With every new evidence this "paleo-environment" becomes clearer. One also develops the skills of reading the landscape and integrating to it the relevant insights from geological maps and reports resulting in an on-going cycle of research in Amman and field trips to the desert. We were basically looking for areas that revealed fossil wood, within the Cretaceous period (144- 65 million years ago), for that would be the ideal habitat of dinosaurs, in wooded lands by the side of lakes, or at shorelines. 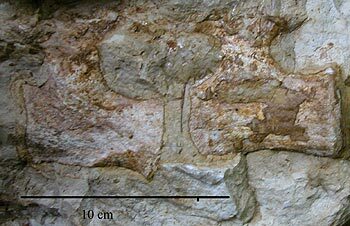 More and more specimens of plant fossils were found, in areas that reports never mention any flora in them. Trunks as big as 50 cm across were found in Wadi al Dab'i, to the south of Harraneh Fort, and slowly we started following this layer further east to find great exposures of it in east of Azraq and in another location extremely rich in fossils: the area of Jibal Ghuzayma halfway between Bayer and Jafr. Not all field trips had all of us; I've developed the habit of sneak solo expeditions, on Saturdays, where I was looking west of the concrete Azraq-Jafr road finding ammonites, fossil-trees, fish, and tiny bone fragments and no dinosaurs. Few months ago, Dr Ahmad A. Samdi and Mr. Hassan Abu Azzam conducted several days of fieldwork in the part of Jibal Ghuzayma to the east of the cement road. Dr Samdi's knowledge of geological layers is fortified by his specialization in micropaleontology, branch of science often considered the backbone of figuring out age sequence of sedimentary rocks. They followed the layer with trees and ammonites, and under a cliff cut by winter waterfalls they spotted some peculiar rock. There were large bone fragments, protruding out of rocks freshly exposed after collapsing from the side of the cliff. Bones within this sedimentation of the 'Mowaqqar Chalk-Marl Formation' are almost always found in round layered rocks geologists call concretions. Often bones are jumbled-up, mixing different parts of the animal skeleton together, and, possibly, with those from other animals, of the same or different species, and with fragments of invertebrates such as baculites (strait ammonite/ squid-related mollusks) and other shelled marine animals. Finding such a bone-rich concretion is like finding a bundle of crushed toys or appliances, and only by a careful unfolding of the entanglement, with the precise recording of each bone-fragment, that the full story of this compact bundle of history can slowly unfold. Reading fossil bones is not easy; scientists often spend months or even years preparing and reconstructing bone fragments, making physical or virtual reconstruction, to understand their function and their relation to other known skeletal remains of the same geological period. This is the work of a vertebrate paleontologist such as Mr. Iyad Zalmout. After initial inspection of the find Mr. Iyad Zalmout could identify the bones as part of a dinosaur, related to the long-necked 'Sauropods'. The largest bone fragment was part of the sacrum (pelvic girdle); other bones included some vertebra of the tail, tibia (leg-bone below the knee) and axis (neck-bone joining the skull). These skeletal fragments of a dinosaur, which would have measures 12-14 meters in length, are very likely to add to science a new dinosaur species. Out of the hundreds of different species of dinosaurs, the majority were identified from only small skeletal fragments often much less that what we have; furthermore, some species were only identified by their footprints. It is also important to note that this was one of the last dinosaurs to live, as just above the layer where the specimen was discovered, the line of mass-extinction (so far most scientists relate to the catastrophic meteor impact in the Gulf of Mexico) marks the end of the Cretaceous Period, at its very last Maestrichtian Stage, ending about 65.4 million years ago. The issue here is that time was very vast and evolution kept coming up with endless varieties; all what we know about animals from the deep past is constructed from such finds, fragments that represent the very lucky animal parts that had the rare chance to turn into fossils. For Jordan, this is an important specimen, if further studies confirm that it belongs to a new species of dinosaurs, and then it might be given the name 'Jordanosaur' or 'Arabiasaur'. The specimens might also become the early core of a Jordanian Natural History Museum project, to house other fragments from other locations found by others. 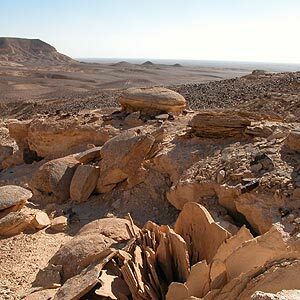 For us, and for our children, to relate to the Jordanian landscape there is nothing stronger than such a find. These fragments should be given registration numbers as part of a national registry system, they should be made available to science, and most importantly they should not end up outside the country, like many other specimens found in Jordan before. 1- Escarpment of Jibal Ghuzayma, with chalk concretions containing bone fragments and marine shelled animals. In this layer, parts of a skeleton of a dinosaur were discovered. 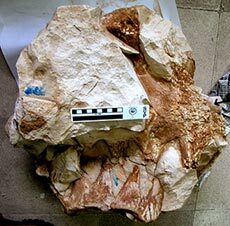 2- Part of the sacrum (pelvis) of the dinosaur. 4- Drawing of full dinosaur of a species of closest relation to the found specimen, locations of skeletal parts, so far identified, are marked in circles. Copyright © 2002-2004 Pella Museum. All rights reserved.